This rehearsal was something of a family affair, as Stowell the Younger sat near the pianist signing a mountain of papers, and occasionally getting up and speaking quietly to the pianist about tempos. The three-act ballet has been compressed into one, but will nevertheless show off the young dancers’ classical technique, acting skills and musicality, which some of them have in spades. The fact that this was discernible at the end of the first week of rehearsal speaks well, very well, for the training at OBT’s school. I regret, deeply, that I won’t be in town to see the actual performances. And I defy anyone to try to tell these students, not to mention the Russell-Stowells, that their art form is dead. Or the folks at Northwest Dance Project, whose next concert is at the Newmark in March, or the Portland Ballet, which is holding auditions for its summer program, or any other practitioner and educator tilling in the fields of classical ballet. Go ahead, risk your life! Item: Last Tuesday, as Mr. Scatter posted, OBT had a bash at the studios to announce next year’s season. The umbrella title for the season is Affairs of the Heart, which is baffling when you consider what the company is dancing. The repertory ranges from the 1841 Giselle (technically speaking, late 19th century after Petipa put his fingerprints on it — if you want to see a version closer to the original, run on up to Pacific Northwest Ballet in Seattle in early June and see their reconstruction) to a 2012 commissioned work to be announced, for the annual Newmark concert series. On that program, we’ll also see one of my favorite Balanchine ballets, the 1972 Stravinsky Violin Concerto, a company premiere. What are the others, you ask? 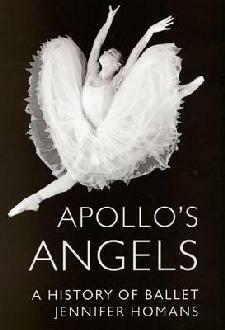 Four Temperaments, already in OBT’s rep; Apollo, ditto; and Agon, which OBT did during the Canfield years, all of them “practice clothes” ballets now. As long as there are people to stage this work, on dancers who get his music-driven, liberating style, Balanchine lives. That program also includes a company premiere of Christopher Wheeldon’s Liturgy, a pas de deux set to the music of Arvo Part, which has been reviewed as a spiritual work (agape rather than eros, I suppose). Lambarena, Val Caniparoli’s fusion of Bach and African tribal music, which is about loving to dance cross-culturally, is also on this program. The season begins with a new Petrouchka, choreographed by Nicolo Fonte, a New York-based dancemaker whose work seems to be performed more often here in Portland than in Gotham, and a new rendering of Carmen by Christopher Stowell. The two choreographers are collaborating on this two-part evening, and saving some bucks, I might add, by using the same mise en scene. It will be interesting indeed to see how they link rather different stories. I don’t think either is basically a love story. Carmen justifies her fecklessness by blaming it on fate; Petrouchka is a puppet in love with a ballerina puppet who spurns him in favor of a boorish blackamoor puppet. So it seems to me that both pieces are much more about free will, or a lack of it, than unrequited love. Giselle is another story, of course, layered with class consciousness, and featuring an affair of the heart that ends in heartbreak for the living and the dead. We’re getting a new production of Giselle; would that were true of Balanchine’s The Nutcracker, but perhaps some of the money garnered from a reprise of Dance United in June will go toward badly needed new sets and costumes. The Holiday Revue, however, will be somewhat reworked by Stowell, with two performances added, and Susannah Mars providing the music, as she did so sensationally last year. That it’s so difficult to match next season’s repertory to its umbrella title is, it seems to me, a good sign: It means the artistic director crafted the season to present a variety of ballets addressing the past, present, and future, certainly with an eye toward what audiences will go for (hence Giselle) but also with the attentiveness to artistic integrity we have come to expect from him. This year’s season is still going strong, of course, with an all-Stravinsky program coming up February 26th to March 5th, featuring Yuri Possokhov’s charming Firebird; Stowell’s own Rite of Spring (both of them revivals); and a premiere on which Stowell is taking a huge chance — it’s a collaboration by Rachel Tess, Anne Mueller, Jamey Hampton and Ashley Roland to Stravinsky by choreographers who are extremely different in style and experience. But if ballet is indeed to live, and American ballet at that, which at least in part was founded on the principle that Americans will try anything, these are exactly the kinds of chances that artistic directors are going to have to take. Ballet is also alive in Eugene, where thanks to a friend’s willingness to drive, I attended Sunday’s matinee performance of a revival of Eugene Ballet artistic director Toni Pimble’s Alice in Wonderland, which was excellently danced, particularly by young Yoshie Oshima in the title role. When it premiered some years ago, a company dancer performed that role, in a costume based on Tenniel’s original illustrations, so there is considerable real dancing involved. Oshima was beautifully expressive and convincing, interacting with props and masks, sometimes fearful, occasionally bewitched, always beguiling. The mask and costume for the Duchess still make that character look like Newt Gingrich in drag, which not a slap at principal dancer Gilmer Duran, who danced the role with considerable relish. The Eugene Ballet is blessed with some very strong dancers indeed, particularly the men. The program, which is geared to families, also included Pimble’s Red Pony, danced to Aaron Copland’s eponymous score. It’s not based on John Steinbeck’s novella, but is a plotless ballet about horses, hard to do without descending into cuteness. Those moments were few, and Suzanne Haag was especially good in the title role. The middle piece was Jessica Lang’s Solo in Nine Parts, originally commissioned by Kansas City Ballet. Danced to Vivaldi, it offers yet more proof that ballet ain’t dead yet. Lang’s choreography employs plenty of ballet technique, but was performed in slippers rather than point shoes, and was accented with modern movement, floor rolls, curved spines and such. I liked it a lot. Movement took a step backward, however, in Portland Opera‘s recent production of Turandot, which I saw last Thursday night. It was directed by Christopher Alden, whose The Flying Dutchman a few years back I thought was terrific, re-cast as it was in Nazi Germany. The same kind of updating of Turandot to Fascist Italy didn’t work nearly as well, I’d say because there was no visually thematic point of view, particularly for the costumes. The chorus was clad in black pants and skirts, white shirts and black ties — perhaps to look like fascist bureaucrats — and while there was an attempt to make them move, they looked like they were doing the herky-jerky. Calaf (Philip Webb) wore a long leather coat that it just occurred to me was inspired by Bertolucci’s film 1900, and did well with Nessun Dorma, but sat while he sang, and when he was performing upright, he did so in the plant-your-feet-and-bellow style. Turandot’s (Lori Phillips’) first costume was a purple velvet suit that looked dowdy, and while she tottered around in high heels from time to time, she too couldn’t really move. The executioner was in traditional Chinese dress part of the time, Turandot’s papa was in long robes, and Calaf’s father (Christian Van Horn) looked like a fugitive from Martha Graham’s Night Journey, her version of Oedipus Rex, in which the Seer periodically jumps across the stage using his long staff as a pogo stick, wearing a long white robe. Would that Calaf’s father had moved that much. Grazia Doronzio, in the role of Liu, the slave girl, not only sang divinely, she could also really move expressively, with a sense of her own body and how to use it. Ping, Pang and Pong, costumed in what looked like zoot suits, leavened the proceedings considerably. But they exemplify for me the patronizing orientalism that infuses this opera, and despite the beauty of the score, makes it difficult for me to enjoy. I thought the orchestra, however, was terrific. 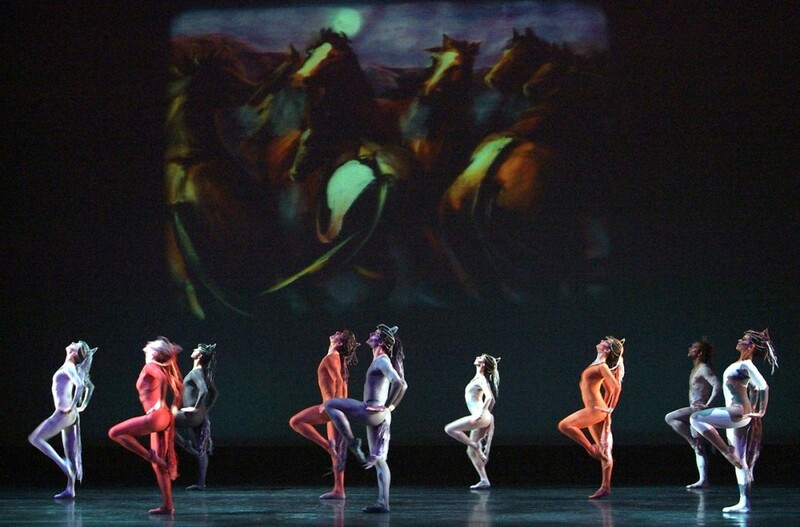 “Red Pony” at Eugene Ballet. Photo: Cliff Coles. 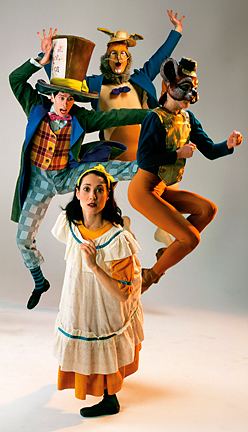 Toni Pimble’s “Alice in Wonderland.” Photo: Eugene Ballet.